One of the major functions of the National Security Agency consists of the interception of signals and the decryption, as needed, of the same (1). The signals can range from military communications from an unfriendly foreign power to voice and digital communications to and from people suspected of being affiliated with terrorist groups such as Al-Qaeda and ISIS. If a signal were to be detected as coming from space from an extraterrestrial civilization, it is almost a given that the NSA would be involved in trying to decrypt it. Some scientists are certain that alien civilizations exist (2).That fact is one reason that a declassified document, entitled Key to Extraterrestrial Messages (3), has caused quite a deal of excitement in the UFO community. The document seems to suggest, on casual reading, that the NSA is already in possession of signals received from aliens. The document consisting of a presentation of a cryptology expert named Dr. Howard Campaigne describes how such signals might be decrypted. A site called UFO Blogger(4) took the NSA document as proof that the government had already gotten messages from an advanced alien civilization and is, in the grand old X-Files manner, covering it up. The site expresses astonishment that the news media never picked up on the revelation when the document was first released in 2011. Could There Be Messages from ET? The theory that the NSA has gotten messages from ET has even made its way onto Wikileaks. 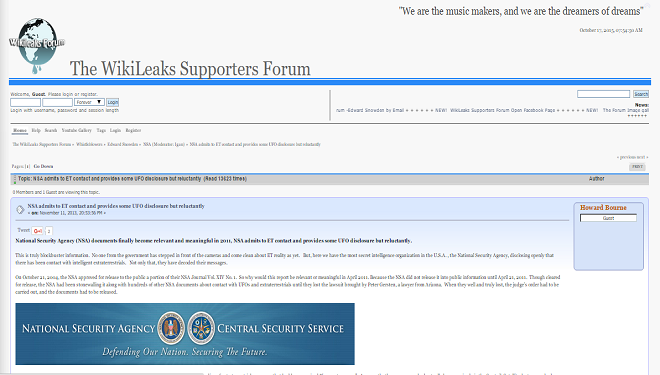 A Wikileaks support site goes on along the same lines of UFO Blogger, making much of the fact that Dr. Campaigne has been a cryptology expert since his service during World War II (5). So, is the NSA in possession of messages from outer space? The answer turns out to be, not really. The document in question turns out to be a description of an intellectual exercise about how hypothetical signals from outer space would be handled. Another NSA document, entitled Communication with Extraterrestrial Intelligence(6), describes a brief history of the Search for Extraterrestrial Intelligence up to the date it was written. It also describes how signals might be sent between two civilizations that might be universally understood. The first signals would be designed to capture the attention of the recipient, probably consisting of a series of prime numbers. The alien signals might also show mathematical formulas, such as the Pythagorean Theorem. Once the attention of the receiving civilization was captured, then more information, likely in the form of images in the form of a television signal, would come. Could the government keep signals from an alien civilization quiet, even if it wanted to? The answer to that question is, likely not. If ET were to contact Earth, the signal would be detected by radio telescopes operated by the privately funded SETI Institute (7). In order to keep in contact with the signal, radio observatories around the planet, such as the one in Parkes, Australia, would come into play because of the rotation of the earth and the need for coverage in different areas. For news of such a signal to be suppressed, several governments would have to swoop in at once, before the SETI scientists alerted the media. It is possible that the contents of said message might be classified, especially if they proved to be alarming. However, the fact that aliens exist and that they have contacted Earth would in short order be worldwide news, the biggest news in the history of humankind. For one to believe that the government would suppress such history-changing news would be to impart it with a competency that it does not possess. As with other conspiracy theories, such as 9/11 trutherism or the moon landing “hoax,” such a secret would involve too many people to keep it a secret for any length of time.